is pretty similar to clubbing elsewhere. I went out with my sister and a group of her friends (all around 18 years old) from 10 – 4 last night. Before I write about this, let me explain why you should read what I say with a grain of salt. * I don’t like clubs. I doubt most people would like them sober. Not that I didn’t have a couple of drinks – I’m just not all that interested in paying exorbitant Stockholm alcohol prices. I’m also not all that interested in losing control, making myself sick, etc. I suppose I’m getting old. When you’re sober, in a relationship, and not into dancing with strangers, clubs simply aren’t exciting. So: the clubbing scene in Stockholm. Many clubs/bars have age restrictions like 21+ and 23+. This meant that the clubs/bars our group visited were the ones that allowed 18-year-olds, and there was a much younger atmosphere than clubs I’ve been to in LA/Vegas/Spain/Italy. 1) Clubbers in Stockholm are both more attractive and more casual than in LA. Or less SoCal. This means that a lot of girls were wearing flats or even Converses, and were generally covered up a little more. But while they were dressed more modestly, there seemed to be more hooking up on the dance floor – which generally seems to be an America vs. Europe thing. Girls dress more provocatively in the States but they put out less. When I say the clubbers are more attractive, I mostly mean younger (this was probably the first time I’ve been out without a 30+ guy hitting on me) and not as many creepers. Also, the stereotype of Swedish girls being gorgeous is true. They are. 2) There are a lot more non-R&B clubs here. The first part of our night was spent in bars with reggae music and (shudder) house music. Europe has this weird house music affliction. It was the same in Italy. I like music I can scream the words to, and occasionally act out through my snazzy dance moves. 3) Drinks are more expensive here, and there is not the same expectation of guys buying drinks for girls. In the States, guys would frequently buy single drinks and rounds of drinks for my friends and I. Here, I’ve heard that it happens (at least for one girl at a time), but you have to be pretty forward. 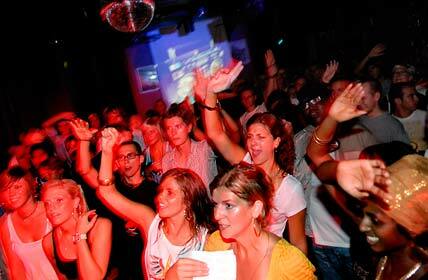 5) Social drinking situations are one of the few situations in which Swedes will become friendly, open and outgoing. I hope that doesn’t sound bad. Swedes have told me this themselves. And of course I’ve met plenty of extremely friendly/outgoing Swedes. I’m talking culturally though. The other situations in which they will approach strangers with a smile are if you are walking with a baby or a dog. And now for the bars/clubs themselves. We started at Treat, a fairly inexpensive bar on Roslagsgatan. My beer was 32 SEK (around 5 dollars). This was my favorite place of the night because it was a bar which meant better lighting and ability to have conversations without yelling. Treat isn’t very classy, but it’s pretty chill and I enjoyed it. We then went to Bonden Bar, also in Sodermalm. We managed to stumble onto their reggae night which no one in our group was too thrilled about. The place itself was pretty decent; small but with a biggish dance floor and couches to sit at. After Bonden, we decided to find a place to dance to Hip Hop/Top 10 music. This quest brought us to Victoria Restaurant (which turns into a club) at Kungstradgarden. Victoria was the first entry fee of the evening: 130 SEK (20 dollars). There was also a coat/bag check fee for a couple more dollars (20 SEK). Victoria was in a classier part of town (near Ostermalm) and the atmosphere was more upscale. The music was mostly R&B/hits, and the place was packed. An outdoor seating area under an awning allowed for people to sit at tables and smoke, etc. My complaint for Victoria was that I put a jacket down on a table and it disappeared. This wasn’t Victoria’s fault, but the workers were unhelpful/rude when I asked them to keep an eye out for it. Finally he said he didn’t care about that I wasn’t single, he just wanted to talk about life and practice English. That was perfectly fine with me, so we went out and chilled and he told me about how reserved Swedes are and how he wouldn’t be having a conversation with me if he hadn’t been drinking. His favorite country was Poland because everyone was so hospitable, and he’d recently quit his job to start his own building company. He wanted to visit America sometime – where should he go? He was Finnish Swedish, no he didn’t want to hear my Finnish, but yes he would. All in all it wasn’t terribly fascinating. He seemed annoyed when I told him my boyfriend was also Finnish Swedish. That was the point he probably realized I hadn’t made him up. I WANT to see you interpretive dance to top 40 music so bad!! !